Stagecoach was the film we viewed in this lecture and this time we touch upon the idea that this film might actually be considered, by some people, to be more of an action film than a melodrama since there is that (mistaken) idea that a melodrama needs to be a soppy romance where everyone dies and no one lives happily ever after. Well that’s taking it to an extreme but that’s still how some people think. Hell, I thought like that, once upon a time! But one good thing about this module is that it has been slowly opening my eyes further to the actual complexity of movie genres in a way that I didn’t expect. So continuing what I was saying is that this film can be considered an action flick since it involves cowboys, Indians and shoot-outs yet you need to look further into the film to actually understand why that is not so. Yes this film has a lot of the characteristics of a regular action packed Western, but what is actually just under the surface is the existence of a lot more character plots rather than action plots. The film focuses more on the characters than the action itself, being that the key to why it is a melodrama. You see virtue being challenged constantly, the persecution of evil represented by the Indians and the corrupt bankers, amongst others. Then we talked about the difference between syntagms and paradigms, basically meaning that the syntagmatic represents a specific “rule of combination” in this case being the Western and the paradigmatic is the various alternatives within a specific category, for example, the locations, firearms and clothing specific to the Western genre. And it’s with this in mind that the idea of stereotypes follows up behind. We all know that in film and even in real life we are all set as a specific stereotype within the eyes of society, and sometimes once you fall into that it’s sometimes hard to come out of it. Because, I think, one of the ways a stereotype is formed is through the very first impression we have of someone. We are a very hard society in the way that we are very hard on each other and consequently on ourselves, so it is obvious that that had to be transmitted onto film as well. 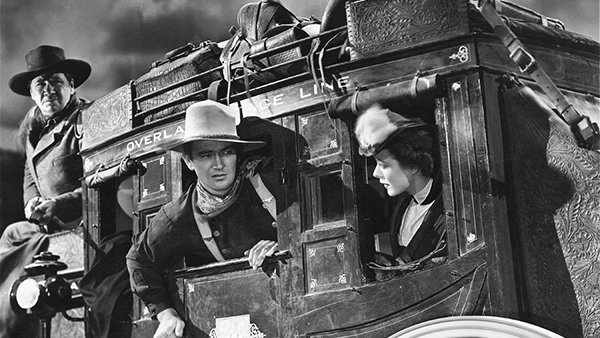 In the Western we see represented in “Stagecoach” the main character stereotypes relating to that specific genre. We further go into the intertextuality and hidden ideology of the film. This lecture also helped me to understand the idea of stereotypes and how myth is formed. « Doctor Who: 50th anniversary!